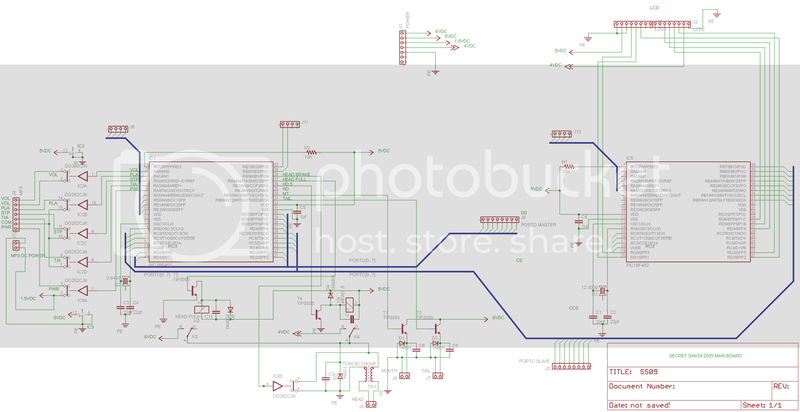 [Segher] has reverse engineered the hardware and command set for the NES CIC chips. These chips make up the security hardware that validates a cartridge to make sure it has been licensed by Nintendo. Only after authentication will the console’s CIC chip stop reseting the hardware at 1 Hz. 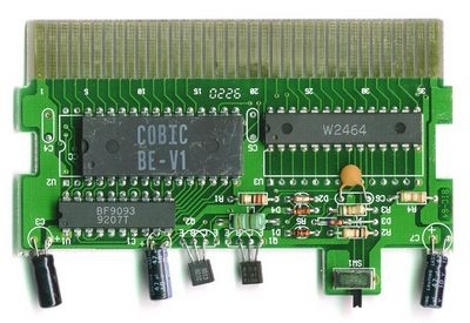 The was no hardware information available for these chips (go figure) so [Segher] had to do some sleuthing with the tools at hand which include some rom dumps from the chip pairs. He was nice enough to share his findings with us. We’re betting they’re not of much use to you but we found it an interesting read. 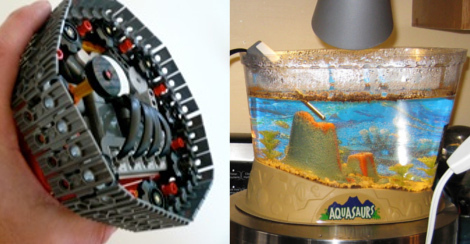 Here’s a double-dose of Lego NXT goodness; a robotic tank and an automatic aquarium heater. The image to the left is a robotic tank powered by the popular Lego Mindstorms NXT kit. 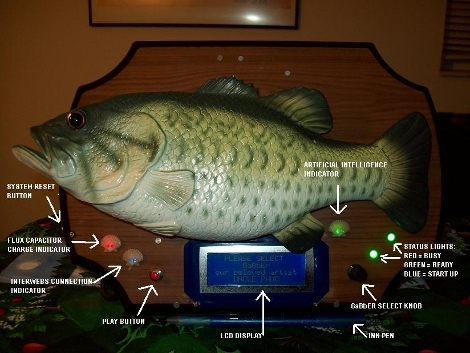 The brains rest inside of a tube, including the controller brick, ultrasonic range finder, a gyroscope, and a compass. Two sets of treads surround each edge of the tube making us wonder which end is up? We’ve embedded a video of this beast after the break. You’ll see that the tank is incredibly agile in this configuration. To the right is an aquarium heater. [Dave’s] kid were growing some tiny water dwellers which we’ve always know as Sea-Monkeys. The problem is that the tank needs to be between 72-80 degrees Fahrenheit for the little shrimp to thrive. He dug out his NXT controller and paired it up with the Lego temperature sensor and a dSwitch relay. This setup monitors the Aquarium for temperatures between 72-78 degrees and switches a lamp on an off to regulate the temperature. This keeps his kids and the stagnant pool happy. Now that we’ve whet your appetite for NXT check out the wiimote operated NXT Segway and the NXT Sudoku solver. 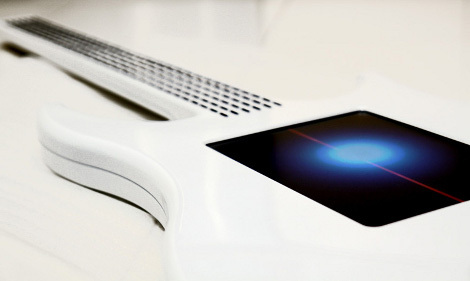 The Misa Digital Guitar is a digital music controller like we haven’t seen before. The body, machined out of ABS, looks like a guitar. The player puts theirs hands in the same places you would on a guitar but the lack of strings make it something different. The left had manipulates inputs in the form of 144 sensors, six in each of the twenty-four fret positions. The right hand doesn’t strum, but uses a multitouch screen to control the inputs. The UI looks solid, something you’ll have to see for yourself after the break. Tieing this all together is an AMD Geode processor running Gentoo Linux. That means this is open source and begging you to make it do your bidding. [Greg] has been working on a version of Debian/ FreePBX/ Asterisk for people to be able to drop onto a SheevaPlug. If you haven’t seen it, the SheevaPlug is a tiny computer housed in a wall plug. They made some waves when they were announced last year, and we’ve spoken of them several times. [Greg] is offering up the operating system in a pre configured format for SD cards so you can just download it and drop it in your SheevaPlug. Yeah, there’s a little bit of work to do before it will boot, which you can see in the video above. Thanks for sending this in [Greg], keep up the good work.